Deciduous oak coppices (Quercus pyrenaica Willd.) of the “Sierra de Gata” mountains (central western Spain) are located on acid rocks and subjected to annual rainfall higher than 700 mm year−1. Accordingly, the soils are acidic (soil pH is often below 5.0) and feature the presence of Mn2+ and Al3+ in the exchangeable complex. The aim of the present study was to assess the response of these soils to the addition of a lime residue from a sugar beet mill to reach pH values close to 7.0 and 6.0 with in situ and in vitro experiments, respectively. Initially, the quality of the lime by-product was evaluated, which showed content close to 75 % CaCO3. Based on that analysis, calculations were accomplished to determine the dose of lime by-product necessary for achieving the targeted soil pH. We first performed an in vitro liming experiment, incubating 0.50 kg soil (0–20 cm layer) with 23.92 g CaCO3 kg−1 soil (20 °C and soil moisture equivalent to that of field capacity). Subsequently, another experiment was done adding an equivalent quantity of sub-product in lieu of the pure CaCO3; the factors monitored were: soil pH, exchange acidity, CEC, and exchangeable bases, every 24 h. The in situ experiment was performed in a forest plot located in Western Spain (Navasfrías), liming with 16.0 Mg DM by-product ha−1 (September 1999). Soil samples (two depths: 0–10 and 10–20 cm) were taken from both the control and the experimental forest plots for monitoring the liming effect. Sampling dates were September and December 1999; June 2000, January, June and September 2001; October 2002 and 2003, and March 2005). The dissolution of the lime by-product at the laboratory was almost immediate, but the effects in the field occurred approximately 2 years after initial liming, since lime dissolution depends on both the amount and distribution of rainfall and, also, on the application procedure. A deep knowledge of the behavior of forest systems is necessary prior to any action of revaluation or improvement of productivity to achieve sustainable development [1, 2]. Traditionally, studies on forest ecosystems (in general, on acid soils; ) have been directed to, in general, a practical point of view, mainly toward achieving high yields  and/or other specific outcomes without considering basic aspects, such as preventing soil degradation, reducing erosion risks, etc., which may have negative effects on forest productivity in the long term. When forest productivity drops, a social consequence is the human abandonment of the affected territories, usually linked to the effect of a progressive acidification of soils . Deciduous oak forests (Quercus pyrenaica Willd.) are abundant in the western portion of the Iberian Peninsula , especially at sites where rainfall is higher than 800 mm year−1; they are installed on acid soils (soil pH is often below 5.0), developed on acidic rocks of the Precambrian Era (shale–greywacke complex, affected by regional and contact metamorphisms; ). Studies regarding better knowledge of these forest ecosystems have been previously performed (e.g., [1, 8, 9, 10]), mainly focused on biogeochemical cycles of nutrients. Gallardo et al. observed different values of production of these deciduous oak forests according to different areas; these differences seemed to be inversely related to the amount of annual rainfall, which caused differences in soil acidity. It is well known that when the soil pH is lower than 4.0, Mn2+ and Al3+ cations exist in soluble forms , increasing their plant availability and causing toxicity, inhibiting forest growth . Furthermore, other works [13, 14, 15] showed the lack of response of these forests to the addition of N and P fertilizers. Runge and Rode  pointed out that adding products containing Ca to acid soils caused benefits to plant growth, due to the increase of soil pH, exchangeable Ca2+, and P availability; in addition to this, an increase in the mineralization rate of the soil organic matter (SOM) was also observed. Bakker and Nys  studied the effects of liming on the evergreen Holm oak (Q. ilex) in soils with different fertility degrees, finding that (within the range of soil fertility of the area considered in the study) moderate doses of lime increased the biomass of fine roots, both in the topsoil and in the sub-superficial horizons, also favoring the availability of Ca and Mg, but not that corresponding to P and K. The effect of liming on some fractions of SOM and soil quality has been also considered [18, 19]. Some authors have investigated the effect of limestone industrial wastes (for example, by-products obtained from paper pulp and steel industries) on forest soils, using them as amendments, given the importance of that re-use in the reduction of environmental impacts [20, 21, 22, 23]. Some by-products resulting from the process of bleaching of sugar extracted from the sugar beet (Beta vulgaris L. var. vulgaris subspecies, Altissima), obtained during the process of the sugar crystallization by carbonation, have been also used as liming material. This sub-product usually contains 75 % CaCO3 and has a basic pH. This calcic material is difficult to handle due to its high hygroscopicity, which decreases its practical use elsewhere; but it could be used as liming material . The addition of this by-product to soil meets two objectives: (1) eliminating this residue; and  raising the soil pH of the acid forest ecosystems. The objective of this study was to assess, through a multi-year monitoring, the soil response after addition of a lime by-product to a forest soil; this by-product, rich in calcium carbonate, was obtained from a local sugar mill. The initial hypothesis was that the addition of calcium carbonate to acid soils would increase the soil pH, decreasing the presence of exchangeable Al3+ that negatively affects forest production. In performing this study, firstly, the properties of the limestone by-product were analyzed. Later, we studied in vitro the effects of the addition of this by-product to a sample of the acid forest soil selected. Finally, we followed the effects, at medium term, of this lime residue added on the soil surface layer of the aforementioned forest soil. The selected forest system was a deciduous oak forest of Q. pyrenaica located at the ‘Sierra de Gata’ Mountains (western Spain). The study site (named Navasfrías) is located in the Spanish Central System (40°2′40″N, 3°0′50″W; Fig. 1), specifically in the Spanish district named “El Rebollar” (North Versant of the ‘Sierra de Gata’ Mountains, province of Salamanca, Spain), at an altitude of 960 m a.s.l. The selected plot was representative of this forest ecosystem and had a surface of 0.78 ha; it was fenced to prevent the entry of wild animals and/or domestic livestock. The climate is Mediterranean, temperate, and sub-humid. The registered mean annual rainfall is 1580 mm year−1 , with a mean annual temperature of 10.4 °C. The rainy season during 1999/00 was dry (793 mm year−1), while the corresponding 2000/2001 season was very wet (2186 mm a−1); the 2001/02 cycle was almost normal (1412 mm year−1), and 2002/2003 season had a very wet fall/winter (similar to 2000/01). There is a wide inter-annual variation in rainfall distribution, but there is always a dry summer. The climax vegetation is the deciduous oak forest (Q. pyrenaica Willd.). This ecosystem can be described as a regular coppice, about 60–80 years old, with a relatively high tree density (820 trunks per ha−1), scarce productivity, and with intermittent cattle grazing, mostly during late spring and summer. This forest has a limited aboveground production (2.6 ± 0.16 Mg DM ha−1 year−1), compared to other nearby deciduous oak forest sites ; for example, measured productivities of closer oak stands are: 3.5 ± 0.28 Mg DM ha−1 year−1 in the El Payo plot, 2.8 ± 0.23 Mg DM ha−1 year−1 in Villasrrubias, and 4.1 ± 0.27 Mg DM ha−1 year−1 in Fuenteguinaldo . A high proportion of this above-ground production (2.60 Mg DM ha−1 year−1) corresponds to leaves 2.1 ± 0.11 Mg DM ha−1 year−1 . The site is considered a marginal area due to the low economic production and is basically appropriate for purposes of conservation of natural species. 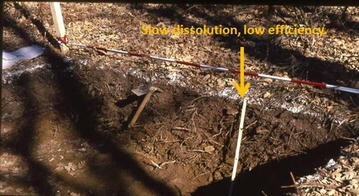 Topographic position defines the soil depth and typography. Dominant soils are cambic Umbrisols , equivalent to the association typic Haplumbrepts in the Soil Taxonomy classification system  and Leptosols. These Umbrisols are usually deep and have a non-permanent organic layer O of litter accumulation; a deep and dark A h horizon (thickness ≥40 cm) with low bulk density (0.60–0.70 Mg m−3); and a B w horizon, sometimes not well developed or detectable (masked by the high content of SOM; [27, 28]), increasing the bulk density to 1.0 Mg m−3 (measured to −50 cm soil depth) downward. To know the suitability as liming material of the lime residue by-product obtained from the sugar industry, the analysis of inorganic and organic C was previously carried out and, hence, the CaCO3 equivalent content was estimated. The measurement of C was performed using a Carmhograph 12 (Wösthoff). During the manufacturing process, the added CaCO3 is mixed with organic waste (OR). Therefore, the organic C (Co) of the by-product of limestone was also determined adding HCl 1.0 N to it and later drying at 200 °C for 2 h. Total C (Ct = inorganic C+ organic C) was obtained by determining directly the C in the lime by-product sample. Hence, the content of inorganic C (Ci) was obtained by subtracting the Co determined from the Ct; the CaCO3 content of the by-product can be obtained by simple calculations. The moisture content of the lime residue was also determined, by the weight loss at 110 °C in an oven. After the characteristics of the sugar industry sub-product were determined in the laboratory as valuable for liming, this material was spread on the described experimental plot (located at Navasfrías, close to 1.0 ha), and the main soil properties were monitored during a long period (from 1999 to 2005). From this experimental forest plot, a subplot (of about 3000 m2) was segregated to be limed and with soil samples taken systematically as later indicated, avoiding border effects. The value 5.7 is the soil pH after the addition of the buffer calcium p-nitrophenol-acetate. According to calculations , 32.20 g of the lime by-product fertilizing per kilogram of soil is required to achieve soil pH 7.0. For this soil study, soil samples were taken from the plot of Navasfrías at two soil depths (0–10 and 10–20 cm), because these layers are more sensitive to the liming impacts. We conformed composite soil samples (for each depth) mixing 15 soil subsamples, using a cylindrical auger at random to obtain a representative sample . For the in vitro study, only a soil sample was taken at a unique depth of 0–20 cm. Reference soil (not limed) samples were taken in June 1996, December 1999, September 2001, and March 2005. In the limed plot, soil samples were taken in December 1999, June 2000, January, June and September 2001, October 2002 and 2003, and March 2005. Soil samples (0.50 kg; soil depth 0–20 cm) were homogenized and then incubated for 72 h with and without application of the limestone by-product, according to the dose calculated as described previously. To evaluate the response of soil to the liming material, the soil pH (with and without addition of the limestone by-product) was measured during the incubation in vitro, comparing the results obtained. The response of the soil sample to the addition of pure CaCO3 (used as reference; 23.9 g CaCO3 kg−1 soil, equivalent to 19.3 Mg CaCO3 ha−1) was also tested. The temperature to which the experiment was conducted was 20 °C, maintaining a soil moisture equivalent to the field capacity. Experiments were performed in duplicate. In each case, three bottles were placed for each dose of lime (by-product or pure CaCO3; i.e., by triplicate); then, n = 2 × 3 = 6 repetitions in total. Every 24 h (24, 48, and 72 h), soil samples were taken from flasks (at random) and analyzed. The selected soil parameters were: soil pH (KCl in saturated paste; and soil:water 1:2.5); exchangeable acidity by extraction with KCl 1.0 N; cation exchange capacity (CEC) and exchangeable bases using neutral ammonium acetate . On September 5, 1999, the lime by-product was spread superficially on the experimental subplot selected, just before the beginning of the autumnal rain season. The planned soil pH to be reached in the field was 6.0. It is not advisable for lime to reach a soil pH of 7.0, due to the high amount of lime by-product (25.6 Mg DM ha−1) needed to achieve it, as this by-product tends to form lumps (given its high hygroscopicity) at the soil surface hindering its dissolution. To achieve this theoretical soil pH of 6.0, 16.0 Mg lime by-product ha−1 was added, according to the dose calculated, as previously indicated, using the formula proposed by Guitian and Carballas , bearing in mind the purity and moisture of this by-product (75 % CaCO3 and 14 % water). That means a net amount added of 12.0 Mg CaCO3 ha−1 (0.48 kg Ca m−2). Incidentally, the soil also received a contribution of 0.47 Mg C ha−1, due to the organic content of the by-product, as indicated above. Soil samples were analyzed according to the routine methods recommended by the WRB-FAO ; the selected soil parameters were: soil pH (KCl in saturated paste, and soil:water 1:2.5), soil organic C (SOC) determined by dry combustion (Carmhograph 8 Wösthoff), soil total N (Ntotal) by micro-Kjeldahl, CEC and exchangeable bases by the neutral ammonium acetate method ; available Ca and K extracted by ammonium acetate, and available P according to Bray and Kurz . The statistical package S.P.S.S. 12.1 was applied to the data obtained. For the statistical analysis of the evolution in vitro of the soil parameters, a design at random with three treatments and six replicates was implemented. To know whether there were significant differences (P < 0.05), a t test of a small number of samples was applied (after verification of homoscedasticity; test of Levene). Differences between the treatments were tested using the one-way ANOVA followed by a Tukey’s HSD post hoc test. When no significant differences between the variables of both sub-horizons were found, soil samples from the two depths were considered as one unique sample. Table 1 presents the soil characteristics of the no-limed forest soil of the plot at Navasfrías; two soil layers (0–10 and 10–20 cm) are considered. These forest soils have high contents of SOC and acid reaction. The available P is, in any case, low but variable over time. The exchangeable Ca2+ presents low values in the first soil layer (0–10 cm) and very low in the second one (10–20 cm), which correspond to low values of available Ca at both depths. The exchangeable K+ has values ranging from acceptable to low, according to soil depth considered. The moisture of the by-product (dried to 110 °C) was around 14.0 %. The content of Ct of the lime by-product (determination by combustion) was 12 %; the content of Co, 3.0 %; and Ci was 9.0 % (Table 2). Accordingly, this by-product had a content of 75 % CaCO3, with 5.0 % organic matter, and 20 % moisture (the rest being inorganic impurities; Table 2). On the other hand, the content of CaCO3, determined adding HCl and measuring the CO2 evolved, was 72 %; this value is close to that obtained by dry combustion (75 %), after subtracting the C corresponding to the organic matter. Limed soils (either with pure CaCO3 or with lime by-product) incubated at the laboratory showed significant changes (Table 3) in the soil parameters analyzed. The evolution of the soil pH (KCl or soil:water 1:2.5) obtained at 24, 48, and 72 h showed significant increases, after the addition of both lime products (0.9 and 1.4 for the pure CaCO3 and the by-product, respectively). However, pH 7.0 was not achieved (as estimated), attaining slightly lower values (Table 3). In any case, pH values increased more with the pure CaCO3 than with lime by-product, probably due to the smaller size of particle of the first liming substance. After the application of the liming material, the soil CEC increased significantly from 26 to 43 cmolc kg−1 (Table 3) after the first 24 h; thereafter, the statistical analysis showed no significant differences. In spite of the increase of the soil CEC values, the percentage of saturation did not vary significantly (less than 10 %), but the exchangeable acidity decreased significantly (of 4.0–0.2 cmolc kg−1) after the liming treatment (Table 3); also, the exchangeable Al3+ was reduced (from 1.4 to 0.2 cmolc kg−1) after 24 h and, afterward, to trace values. Moreover, after adding the liming products, a significant increase in the values of the exchangeable Ca2+ occurred, as well as a decrease of the exchangeable Mg2+, indicating that the former cation is preferred to be adsorbed by the exchangeable complex; the exchangeable K+ also decreased by the interference of the dominant exchangeable Ca2+. Tables 4 and 5 show the temporal evolution on-site of some soil parameters after liming (5 September 1999); we have only considered two depths (0–10 and 10–20 cm), which are more sensitive to the impact of a superficial liming. The observed changes in the soil parameters were most noticeable in the soil layer 0–10 cm, but less intense than those observed in the in vitro experimentation (Table 3). Soil pH increased very slowly after liming, with a noticeable increase being in January 2001 (second winter). The maximum pH values were reached in October 2003 and, later on, in March 2004 the soil reached the predicted pH (around 6.0; 3 years after the initial liming), increasing the saturation of the CEC to 85 % in the soil layer 0–10 cm. A parallel and significant increase in the exchangeable Ca2+ was observed, reaching the maximum value (22.0 cmolc kg−1) in October 2003, as also observed in March 2005 (Tables 4 and 5). The exchangeable Mg2+ also showed a significant increase, with a faster increase by January 2001 than that observed for Ca2+, the maximum Mg2+ (1.8 cmolc kg−1) appearing in January 2001, but returning to the initial value at the end of the period considered. The values of the exchangeable K+ decreased significantly (0.3 cmolc kg−1) during the first 2 years of experimentation; later, they increased to a value close to the initial one. The values of the sum of the base fluctuated significantly, parallel to those of the exchangeable Ca2+, affecting the values of the percentage of base saturation as a result (Tables 4, 5) and giving maximum values after October 2003. SOC and Ntotal contents did not show significant variations, given the high standard deviations of the mean (Table 2); the same observation is pertinent to the C/N ratio. The available P suffered oscillations during the period of study at both depths; a significant increase of available P was observed after liming (reaching values above 20 mg P kg−1), returning back later to the initial value. The content of available Ca increased significantly over time, but without a net pattern, attaining a maximum in October 2003 (4.8 mg Ca g−1), affecting mainly the first soil layer (0–10 cm). On the other hand, the available K did not differ significantly. The values of the soil parameters of the control subplot are not limed (Table 1) inside the range of values obtained by Quilchano et al. and Gallardo et al. [9, 27] for the plot studied here. Quilchano et al. observed high standard deviations for values of SOC, Ntotal, and C/N ratio; the annual fluctuations of these parameters (mainly SOC content) are attributed to the autumnal fall of litter (seasonal organic inputs). The standard deviations for the rest of the parameters are lower and the significant differences observed in the limed subplot in relation to the no-limed one should be attributed to the effect of liming (except for the available P, given that availability of P is also influenced by other soil properties, as the soil pH, inputs of organic residues, and/or the presence of free sesquioxides. The observed difference of exchangeable Ca2+ between these two soil depths is caused by the effect of the biogeochemical cycle [34, 35]. Analysis of the lime by-product (originated from the sugar industry) used indicated that it appears technically recommendable because it has a high content of CaCO3 (75 %). Thus, this material is considered suitable for liming acid soils , despite having definite hygroscopic characteristics and, hence, tending to clump. Besides that, 3 % of the impurities of the lime by-product are organic C (Table 2); that is, 5 % of the by-product is organic material. Since the SOC content (referred to −20 cm depth) is 103 Mg C ha−1 , an additional contribution of 0.5 Mg C ha−1 on the soil surface (as organic residues included in the limestone by-product) does not represent a significant contribution of C, taking into account the slow mineralization of this organic material because of its fibrous nature . Properties of the forest soil samples (limed in vitro) showed significant increases, especially soil pH, CEC, and exchangeable Ca2+ (Table 3). Rodenkirchen  indicated that liming increases the exchangeable Ca2+. The quick increase of the CEC value indicates that the increase of soil pH activates immediately negative charges of the CEC (very weak acids; ); nevertheless, the methodology of CEC determination (the soil pH is adjusted to neutrality with ammonium acetate) could partially mask the extent of this increase. The percentage of base saturation did not appear to be influenced by liming over the short term due to the significant increase of the CEC caused by the liming; nevertheless, the exchangeable Al3+ (which decreased sharply, to be finally undetectable) suffered the desired effect of inactivation (decreasing its toxicity to roots ). The significant decrease of the values of exchangeable K+ after liming is probably a result of its displacement caused by the abundant Ca2+ added . Limed soils incubated in vitro showed more intense changes in soil parameters than those limed on-site. Comparing our results, in situ vs. in vitro experiments, it is inferred that the characteristics of the sugar beet by-product (hygroscopicity, particle size, and the method of addition to soil, that is, added on surface) hinders a rapid neutralization of the soil in the experimental plot. The data of soil pH and exchangeable Ca2+, observed in the limed plot, lead us to conclude that the liming material dissolved slowly. This was corroborated visually, because the white by-product was observed (not dissolved) on the soil surface until the very rainy winter of 2001. The low exchangeable Mg2+ content of the lime by-product dissolved before the Ca2+ (Mg2+ is considered a soluble cation), but it also returned most quickly to the initial value (before the end of the field experiment). The decrease in exchangeable K+ observed in situ, should be motivated by the displacement of K+ from the exchangeable complex when Ca2+ is added , being subsequently leached by rainwater to lower horizons (obviously, this loss of K+ cannot occur in the in vitro test). This same phenomenon was also observed by Matzner et al. . The erratic behavior observed for available P is because its bio-availability is affected by different soil factors as indicated before (for example, precipitation by active forms of Ca, Fe, and/or Al); and thus it did not show any clear pattern. It was previously demonstrated that the soil sesquioxides (Fe and Al) quickly precipitated the dissolved P [34, 35, 40, 15]; as a result of this, it is not possible to improve the availability of soil P with the sole addition of liming material. Komljenovic et al. found that liming influenced the annual production yields, but so did the climatic factors; given the low dissolution process of the CaCO3 added, it is difficult to think that the dissolved liberated Ca2+ could have more impact than the sesquioxides. The data obtained during the 6 years of experimentation show that the effect of the lime by-product was only evident after the third year, having its largest impact on the soil parameter related to the exchangeable complex . These results are also consistent with those observed by Matzner et al. in a similar work performed in Germany; their studies found that the superficial application of lime to the forest selected caused an increase of about 20 % in the base saturation value of epipedon after several years, which reduced the risk of Al3+ toxicity. However, in their study losses of SOC and N total (11 and 14 %, respectively, referred to a soil depth of −30 cm) were observed; they also observed that the liming effect on the soil C and N obviously was lower when the lime was applied superficially than when incorporated into soil by tillage. Tang et al. found that the liming product was not dissolved until 2 years after it was added to the soil. Furthermore, Bakker et al. , analyzing the effect of the gypsum and lime on forest soils, observed that adding CaO increased the soil pH as well as the exchangeable Mg2+ and Ca2+, reducing also the exchangeable Al3+ content (mainly in the Ah horizon). The liming impact on the SOM content is insignificant in our experiment, given the high variability of the indicated parameters (SOC, Ntotal, and soil C/N ratio), as previously indicated. However, liming affects soil microbial activity, because it is enhanced when the soil pH increases [45, 46], changing the quality of SOM [18, 19] and, consequently, the soil C/N ratio . Therefore, the liming effect on the C and N cycles is clearly dependent on the dissolution rate of the lime product; e.g., a significant part of the Ca could remain as carbonate on the epipedon if there is not enough rainfall. Matzner et al. determined that in their experiment, 50 % of the applied Ca was found in the organic layer O and another 27 % in the epipedon (A h horizon). The no-dissolved CaCO3 was impossible to be quantified in the experimental plot because of the involved difficulties, but the visual observation of the white spots in the forest soil indicated the resistance of the by-product to dissolve. These dots disappeared completely during the wet season of 2002/2003 (from fall to spring), after two rainy winters. Additionally, uninterrupted soil moisture would sustain strong CO2 emission by microbial respiration . Our analyses show that the superficial application of this lime by-product had (Tables 3 and 4), in the short term, a limited effect on the soil pH of the epipedon (rather concentrated in the top −10 cm and weaker further down, i.e., 10–20 cm). The evolution (in vitro test) of soil pH, after being limed with this lime by-product, was similar to that observed when pure CaCO3 was added, increasing significantly the values of the soil pH, CEC, and exchangeable Ca2+, and decreasing the exchangeable Al3+ to an undetectable value. Therefore, this lime by-product can be considered potentially valid to correct soil acidity. However, the liming effect on soil properties of the field forest plot was only detectable after 3 years, mostly conditioned by climatic conditions (the first meteorological cycle was dry, just after the addition of the lime by-product); furthermore, other factors that may have had an adverse influence included the surface lime application (given the limited conditions of forest systems) and the size of granulation (economic reasons do not permit the previous grinding of the lime by-product). As a result, the effect of liming on soil pH was more gradual than expected (especially, in comparison with results obtained in vitro). This study shows, once again, that the direct implementation in the field of results obtained in vitro (without complementary experiments on-site to validate the in vitro trials) can lead to significant divergences in results, given the differences in factors and conditions existing between laboratory and the natural conditions. IMG directed the work done on the field (in situ experiment) and the lab analysis of soil samples; JFG planned the overall experiment and coordinated and drafted the manuscript; JAE directed the work done in the lab (in vitro experiment); JJO performed the initial lab analyses as part of her Master studies abroad. All authors read and approved the final manuscript. This work was possible thanks to the support received from the European Union (PROTOS/TERI Project) of the Spanish Ministry of Education and Junta de Castilla y León (Spain). The authors point out also their gratitude to M. González and J. Hernández-Pombero for technical help. The authors appreciate the English editing performed by R. M. Buxton. EPA. 2007. The Use of Soil Amendments for Remediation, Revitalization and Reuse. Docu. 542-R-07-013, U.S. E.P.A., https://clu-in.org/download/remed/epa-542-r-07-013.pdf. Accessed Dec 2007.